« Yul Brynner Played Guitar? Prima Luce is Latin for “first light,” or dawn. The melody of the song was inspired by my thinking about a cross-country trip I made with my family last summer, and driving through the Nevada desert at the sun was coming up. It was absolutely moving. To be perfectly honest though, making another instrumental was not my original intent with Prima Luce. I wrote the backing parts of the song over a month ago. Since then, I had been trying to come up with lyrics and for some reason, words just wouldn’t come. So early this morning, I woke up with the intent – yet again – to pen some lyrics. But I ended up noodling over the backing track, and came up with a melody line. I realized that this song was meant to be an instrumental. Guitars: Rhythm: 1958 Les Paul Historic (Amber)*, Lead: 1998 American Deluxe Strat (Heather)*. * Note that the signal chain for these included an EHX Soul Food Overdrive and Mad Professor Deep Blue Delay (handwired). 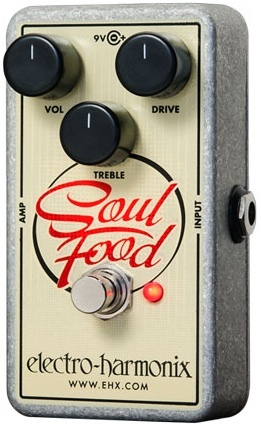 I hate to say it, but the Soul Food has become my number one overdrive. It just works with every guitar and every amp I have. It’s purely amazing! When I was recording the lead, I set the Drive to about 3pm and the volume at about 1pm. With a Les Paul, that would’ve created over-the-top breakup, but with a Strat, the pedal brought out all sorts of harmonics and sustain with less distortion than with a Les Paul. I just closed my eyes and let my fingers do the talking. I like this a lot, Dawg! Been listening to it over and over. I think you should write more instrumental music, not less. Also I prefer the all Les Paul version of this. Keep the music flowing!